Address: Building F12,No.110-1,first Industrial park of Li Song Lang,GongMing street ,Guang Ming new district,Shenzhen,China. JP-2144GH is a twin ultrasonic tank, 1st tank for cleaning , 2ed tank for drying. Precision cleaning of your aircraft components is an operational safety requirement – a matter of life and death. Parts need to be thoroughly prepped to meet stringent aviation safety norms. Cleaning being an important element in this process requires special consideration. Traditional cleaning methods are labor intensive and inconsistent. Parts that require cleaning typically require pretreatment before being subjected to an aggressive cleaning regime that could involve water or sand blasting. This can decrease the life of the component material and in some cases even damage the surface. Ultrasonic cleaning is a revolutionary approach to cleaning that drastically reduces the cleaning time while improving the quality of the cleaning action. The cleaners work on the principle of agitating aqueous or semi-aqueous cleaning solvents using high frequency sound waves. With ultrasonic cleaners, parts cleaning is a batch operation. This saves hundreds if not thousands of person-hours as compared to the traditional process where each part requires individual attention. 1st ultrasonic tank: installed with ultrasonic cleaning transducers to operate cleaning process by ultrasonic transducer vibration. 2nd Dryer tank : it has heater and hot-air circulation system. Usually one dryer tank take 8~10 min to dry parts. The heated air generated by motor circulated to dry the parts. The heating temperature is adjustable(room temperature~200℃). You can adjust temperature when drying plastic parts and usually not affected. 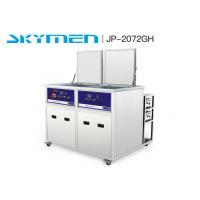 Skymen can also OFFER 3 tanks, 4 tanks, 5 tanks big ultrasonic cleaner machine, and fully automatic ultrasonic cleaning machine. Any question or technical problems, please don’t hesitate to advise us. How to use an ultraosnic cleaner ? 2 Put the clening items in, the cleaning items should fully immersed in the water. For oil removed, chemmicals is necessary. Put the lid and wait till the wash cycle finished. The process of ultrasonic cleaning utilises high frequency sound waves which are radiated through a liquid medium. These sound waves are created by a number of transducers which are bonded to the base of the ultrasonic bath. As an electrical current is passed through the two transducer crystal rings they become agitated and vibrate at around 40,000 times a second. This vibration converts the electrical energy to sound energy which is then transferred through the base of the tank into the liquid. As the sound waves pass through the fluid microscopic bubbles form. These bubbles continue to grow in size until they become unstable and cannot support their own density, causing them to implode. This is the phenomenon known as cavitations. As these bubbles collapse the surrounding cleaning fluid rushes in to fill the gaps, which creates an action similar to that of a scrubbing brush, but thousands of times a second per cubic centimetre. It is this process which gives ultrasonics its powerful cleaning action and makes it the most effective method for removing contaminants from hard substrates or complex shapes. Another major benefit of ultrasonic cleaning is its ability to reach hidden areas. This will occur anywhere where water particles can reach. This means that items such as cylinder heads, which have a number of internal channels, will be thoroughly cleaned throughout. The cleaning fluid will flood these channels enabling the scrubbing action to work in even the deepest and smallest spaces.